First 2 rounds of NFL playoffs showed defense and rushing still matter. Seahawks need upgrades on D-line to keep 10-6 from turning into 6-10. However, the Seahawks’ one-and-done appearance in the tournament was at least competitive, and provided a chance the past weekend to look around to see what’s working in the NFL. What was working, mostly, were defenses, not the greyhound-race offenses that floozy-ed up the first two-thirds of the season, convincing many pundits that if a team wasn’t passing on nine out of 10 snaps, they were as irrelevant as Princess phones. From a Seattle perspective, two developments stood out, both in the same game with the most local interest. After getting 137 yards on 26 carries in beating the Seahawks, Cowboys RB Ezekiel Elliott was limited to 47 yards on 22 carries in the Rams’ 30-22 win in Los Angeles Saturday. That development was paired with the Rams offense, which had 248 yards rushing, thanks mostly to 123 yards in 23 carries by waiver-wire refugee C.J. Anderson and 115 yards in 16 carries from star RB Todd Gurley. I don’t know where Seahawks coach Pete Carroll watched that game, but I hope the place had plenty of drool buckets for him. For all of the Harry Potter-esque wizardry ascribed young Rams sorcerer Sean McVay, he stole Carroll’s Dumbledore playbook. McVay’s ability to seamlessly convert his offense to the run, and his re-emphasis on the run defense — the Rams defense was 23rd in the NFL against the rush in the regular-season — were exactly what Carroll would have conjured. It helped that the Rams, diminished by a knee injury to Gurley late in the season, stumbled into free agent Anderson. He was on the couch, having been discarded by the Broncos, Panthers and Raiders in 2018. As the Rams’ success relates to the Seahawks in 2019, the Seattle offense has its quarterback, running back and line set, give or take a D.J. Fluker. What the Seahawks don’t have yet is a front seven that can slow a premier runner sufficiently to help salvage a secondary still in toddlers’ clothes. 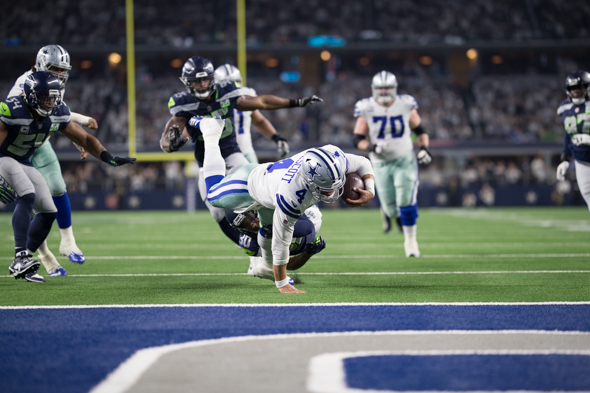 Elliott’s rushing controlled the wild-card game, as Gurley and Anderson controlled the divisional game against Dallas. In the Patriots’ 41-28 win Sunday over the Los Angeles Chargers, RB Sony Michel had 129 yards in 24 carries to keep the pressure off QB Tom Brady. Is running the ball old-fashioned? Yes. So is eating. Defense is the Seattle vulnerability. The Seahawks defense finished 11th in average points allowed (21.7) and 16th in average yards (353.3). Not terrible; not playoff-winning good. The mediocrity was mitigated some because they led the NFL in turnover margin — 26 takeaways, 11 giveaways, the latter the second-fewest in NFL single-season history. But in the turnover triumph, there was an asterisk — the Seahawks’ seven interceptions (three by FS Earl Thomas, who played four games before breaking a leg) were the fewest in franchise history. While some of that can be ascribed to inexperience among DBs Tedric Thompson, Tre Flowers, Delano Hill, Shaquill Griffin and Akeem King, the fact is that the Seahawks are largely committed to this young crew for the near future. The weakest links in the front-seven defense were the two spots on the line not occupied by DE Frank Clark and DT Jarran Reed, who were well above average. Shamar Stephen was mostly a non-factor at right tackle. At left end, Quinton Jefferson was OK in his 12 starts, oft-injured Dion Jordan not so much in his four starts. To the Seahawks’ credit, they saw the D-line shortfall coming two years ago, dedicating a first-round draft choice to fix the problem. To their discredit, they chose Malik McDowell of Michigan State. He validated the warnings in scouting reports about immaturity when an ATV accident in the summer following his selection wiped out his career. Then when the career of DE Cliff Avril abruptly ended in 2017 with a regular football injury, the D-line problem snowballed. This off-season, via free agency and/or the draft, the Seahawks need to upgrade both D-line positions, as well as seek a successor to veteran LB K.J. Wright, a valiant warrior for seven seasons who seems destined for free agency, given his age, injuries and potential expense. He could return more cheaply for one season if he gets no meaningful offers in free agency. While the Seahawks have substantial room under the salary cap ($60 million) to sign free agents and give raises to Clark and others, they have only four draft picks. They gave away three 2019 choices via trades — a second for LT Duane Brown, a sixth for backup QB Brett Hundley (a seasonal DNP) and a seventh for SS Shalom Luani. That means the Seahawks are nearly congenitally predisposed to trade their first-round pick, No. 21 overall, to acquire more picks later. The paucity of assets means getting a better front seven will be expensive, via free agency. But it’s critical because the Seahawks’ 2018 results may have been a bit of a false positive. For the sixth time in Carroll’s tenure, the Seahawks won 10 regular-season games, but some empty calories were a noteworthy part of the meal. They played seven teams that ended with winning records, going 3-4 (wins over Dallas, Minnesota and Kansas City, all at home), while taking advantage of down years by NFC rivals Carolina, Green Bay and Detroit. Then there were the sugar highs of five games against arguably the three worst teams in the NFL (49ers, Cardinals and Raiders). While it has been mentioned often this season that the Seahawks never lost a game by more than one score (the Chargers’ 25-17 win was the largest margin), it is also true they won four games by three points each (both Arizona games, Green Bay and Carolina). Cumulative results suggest the Seahawks’ 10-6 record easily could have been 6-10, but for the random bounces from a carry fumbled or a pass tipped. Nothing wrong with good fortune, so long as no one is seduced by it. And it remains wise in the NFL to load up on defense and the run game, because the fizzy stuff tends to dissolve in the dark, wet and cold of January. Good, thoughtful comments, Art. And thank you for the perspective on the Seahawks season regarding strength of opponent. As valuable as defense is, with the San Diego/New England game a total shocker; I’d like to add this perspective. For the first time in NFL playoff history, the top four offensive clubs have qualified for the final four spots. The four clubs have two QB’s who will lead the prime all-time stat categories on retirement and two others who may be the best two out of college in the last half dozen years. Interesting stat re: final four are the four top offensive teams. Perhaps a top 15 defense paired with a op 5 offense is the formula? Defenses still need the resources to be credible. Defenses may be giving up an extra three points a game over 5-6 years ago, but that’s not a reason to go all in on offensive skill players. Agreed. Balance is the most important thing in sports and in life. And stats can always be misleading. The top four in points are the ones I mentioned but when you do it for yards Tampa Bay sneaks in! Injuries can be a huge factor. My Celtics last year are a case in point. Someone said it’s not just who you play but when you play ’em. And where. Seattle beats Dallas if the game is here. That someone was Chuck Knox, and I bet he wasn’t the first NFL coach to realize how ephemeral success is week to week in the NFL depending on the health of key players, many of whom play hurt and diminished. We’ll rarely hear about them. Survival of the top four offensive clubs is partly the result of rules changes protecting QBs and receivers. It tough to play effective defense against a stacked deck. Good food for thought. I read this just after reading the 538.com analysis of Seattle’s rushing attack. I’m not sure how to digest all this, but it does argue for more offensive flexibility. If Fluker and Sweezy had been healthier, your digestion would be better. Not having a target on their back this past season had to help their record as well. Most of the foes on the schedule were in no place to overlook any opponent. One of those foes was the Lions, who hired Bevell today to be OC. There’s a big #99 on the Washington Huskies who may be of help. I’m thinking Gaines is a day-three draftee as a run stuffer. A tad shy in arm-length and foot speed. You forgot Poona Ford who impressed as a run stopper whenever he got the chance. I’m skeptical that the Hawks have their ” . . . line set, give or take a D.J. Fluker”. He and Sweezy are good players when they don’t have to play injured, as they did against Dallas. The result was Chris Carson gained a total of 20 yards. The lack of depth couldn’t have been more obvious. With all the needs on defense, hopefully they can shore up the O-line also. Almost no team in the NFL has O-line depth, and Seattle lost what it had with the injury to Jordan Simmons late and to rookie Jamarco Jones early. Of course the unit can use help, but there are greater priorities. I think it’s a risk to count on anything near a full season with Fluker. He’s a starter for maybe 9 or 10 games at most. Sweezy is decent, but clearly not top-grade. Britt looked bad against Dallas, for example, but is also decent. Pocic has been a disappointment. Ifedi has perhaps gone from bad to average overall. Brown remains our best lineman by quite a long shot. Fluker’s enormity has made him subject to muscle strains and pulls throughout his career. He also has a harder time with D-line shifts. I would think an upgrade will be pursued. The rest of the starters are likely back. Good column with good info/stats Art. Aside from what may/may not ail the Hawks, after the complete dissection and nuking by the Patriots, I must say, head coaches should lock themselves and their assistants into a film room for weeks to see and understand what the Belichick/Brady steamroller accomplished. I was pulling for the Chargers, but as the game progressed I must admit my admiration for the Patriots game plan. They controlled the game with their rookie RB Michel and changed up their defense’ game plan to completely confound Rivers, one of the very best. He had Patriots on his back the entire game, and their scores were irrelevant to the demolition conducted by Belichick. After this game, I wouldn’t bet against NE, even if the game is in KC. Belichick/Brady/Kraft have created axis of power that is the best in NFL history. All three are ruthless. Over the years, Brady has been remarkable in his not needing much in the way of offensive “star” support. The Gronk has been their most consistent star on offense, yet as all his other receivers and RB’s have come and gone, it seems Brady just plugs and plays. It is remarkable, as is his arm strength and accuracy, no matter the age. It’s always been a system success with Brady as its master. None of his offensive teammates want to be the subject of a Brady sideline tirade. Can’t disagree with that statement. But “ruthless” for NE includes cheating. They’re a great villain, I suppose, with Grouchy Belichick, Creepy Kraft, and Pretty-boy Brady, and the fact that they’re so hard to defeat. I don’t know how they could be more loathsome. Mean nicknames? Are you seeking a job in the Trump admin? Ouch! Was I that mean? I wouldn’t qualify for the Trump team because there’s an element of truth to my post. Playing Brady in New England in the playoffs with a zone defense is like the Dutch boy with his finger in the leaking dike. Nothing will work for long. Brady, with little pressure, eviscerates zones. The Chargers have been severely scolded for sticking with a zone. Brady looked like he did in the 4Q of the Game That Cannot be Unseen. Ford was a quality find as an UDFA, even though he was the Big 12 defensive player of the year. The trouble with this theory is at least some of the facts. The Hawks ran very, very successfully against the Rams in both games they played. The most jarring two games for our coaching staff should be ours against the Cowboys, and one week later the Cowboys against the Rams. The contrasts in line play on both sides of the ball should be illuminating, not only as to our talent, but also as to our play-calling. As I wrote in a previous column, injuries to Sweezy and Fluker played a notable role in DAL. Neither played close to average, and DAL’s increased use of D-line movement made it tougher on SEA. It seems that the loss of Malik McDowell hurt us deeply.